Learn French By Podcast For Free! Why Did I Start French Your Way Podcast? All the topics and the themes for the episodes come from a long list of typical mistakes or confusions that students of French make all the time, and so I’m very familiar with these problems and I’ve decided to really do something about it. Every day when I’m teaching, I write down new ideas of French notions to explain based on what my students ask, stumble on or what we’ve been talking about – because we sometimes have passionate discussions about the origins of words or related words. My philosophy is that when you understand the ”why”, things become more relevant and therefore more memorable! Who is French Your Way Podcast for? You want to expand your vocabulary, to be more aware about false friends and common mistakes which often result from a wrong translation from English. I believe you will get something out of French Your Way Podcast because I hear the common mistakes and confusions I am talking about in the episodes on an everyday basis, with beginners as well as with advanced students of French! Note: French Your Way Podcast is not a course. Enjoy the episodes in any order you like. Get your own questions answered by me! Subscribe to iTunes to automatically receive the latest episodes. 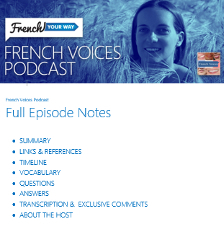 Alternatively, you can find the episodes on Stitcher and on my French Your Way website. Leave a review on iTunes as an appreciation for my work. Each review counts and will help me be found by other French students. I’m very grateful, I appreciate so much, merci beaucoup, thank you!! 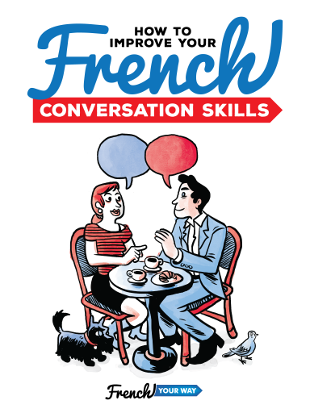 Submit your questions about French ! I’d love to help and may turn your question into an episode or an article! Merci beaucoup! 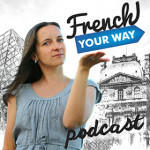 Enjoy the episodes of French Your Way Podcast and keep in touch!